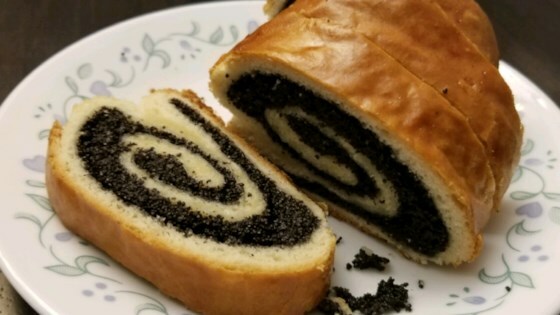 "Tender, soft, sweet yeast bread swirled with a creamy homemade poppy seed filling. Growing up, my mother and aunts always made this Eastern European bread for Easter and Christmas. Looks complicated, but is easy enough to make for an Old-World treat. I like it best after the second day." Place poppy seeds into a food processor and process until seeds are ground, about 1 minute. Mix poppy seeds with 3/4 cup sugar, 1 tablespoon melted butter, lemon juice, and hot milk in a bowl; stir to combine. Cover poppy seed filling and refrigerate while making bread (filling will set up and thicken as it chills). Mix yeast with water and 2 tablespoons sugar in a small bowl. Allow to stand until the yeast forms a creamy layer. Whisk flour with salt in a bowl; use a pastry cutter to cut 1/4 cup butter into the flour mixture until the mixture resembles coarse crumbs. Pour yeast mixture and egg yolk into flour mixture and stir to make a soft dough. Turn dough out onto a floured work surface and knead until smooth and slightly springy, about 5 minutes. If dough is too sticky, knead in more flour, about 2 tablespoons at a time. Cut dough into 2 equal pieces. Roll each piece out into a 12x16-inch rectangle. Spread half the poppy seed filling over each rectangle, leaving a 1-inch border. Fold the 1-inch border back over the filling on all sides and press down. Pick up the shorter side of a dough rectangle and roll it like a jelly roll; repeat with second rectangle. Pinch ends together or tuck ends under to prevent filling from leaking out. Line a baking sheet with parchment paper; place rolls seam sides down on the baking sheet and allow to rise in a warm place until doubled, about 1 hour. Beat egg white in a bowl until frothy; brush the rolls with beaten egg white. Bake in preheated oven until dark golden brown on top, 30 to 40 minutes. Remove from oven and cover rolls with a clean kitchen towel until cool to keep crust soft. Cool completely before slicing. Learn how to make impressive, homemade poppy seed dinner rolls from scratch.